We just saw the best January for stocks since 1987. And February is shaping up to be just as impressive. In total, the Nasdaq Composite Index is up about 19% from its December low. And these gains will likely continue. The reason why is a little-known market phenomenon. This recent trigger means billions of dollars will soon go "long" stocks. And this huge flow of cash should ensure the recent rally in stocks isn't over yet. On Monday, the Nasdaq traded above its 100-day moving average for the first time since early October. Moving averages are a simple way to gauge market trends over a given time frame. If stocks are above their moving average, the trend is up. If they're below it, the trend is down. Normally, there's nothing special about the 100-day moving average (or "100-DMA" – the average price of the last 100 trading days). But in today's case, it's important. CTAs use asset-allocation models for their portfolios that are built on "quant" programs. This means they use mathematical and statistical methods to determine risk and other factors. So as markets hit key levels, the models issue buy and sell signals. These models, though, are built for slow and steady moves in the markets. They aren't suited for the rapid swings we've seen lately. As an example, they were leveraged long at the top in September... and max short around the bottom in December, just three months later. These CTA funds tend to cause a "pile on" effect in the market. So, when the market goes up, they make it go up more. When it goes down, they make it go down more. This is partly because over the last 10 years, their assets have swelled by 36% to roughly $360 billion. But these firms also use massive amounts of leverage, usually around five times their capital. As a result, they can have a market impact of up to $1.8 trillion. That's huge. Stocks have soared since then. 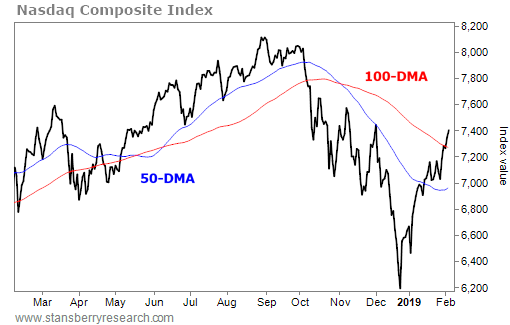 A few weeks ago, the Nasdaq crossed above its 50-day moving average – and the CTA models began to signal that they should start to cover their short positions. To close a short position, you have to buy shares... which means a huge amount of money has started flowing into stocks. Closing above the 100-day moving average is important. That's what tells more of the CTA asset models to either cover short positions or buy more stock. This should cause the "pile on" effect to push stocks higher from here. As the models signal "buy," and those funds push the market higher, it signals to the next set of models that they need to buy. This has been a boon for practically everyone but the CTAs themselves. Closing above the 100-day moving average is positive for other reasons, too. 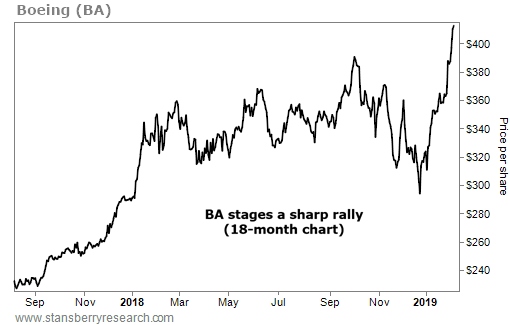 It will likely become a support level for the market going forward – a point where investors stop selling. The next big level to watch will be the 200-day moving average. Breaching that level will mean more CTA signals to push the market higher... and stronger long-term support. This doesn't mean stocks can't go lower, of course. But breaking the 100-day moving average means more buyers are likely to enter the markets. And that means the recent stock market rally isn't over yet. Editor's note: Scott and his team of analysts at Stansberry NewsWire reveal what's happening behind the scenes on Wall Street, so you can profit on Main Street. They scour the markets to show you the forces driving the market's daily moves... complete with up-to-the-minute news, expert commentary, and fresh trading ideas. You can learn more about this service – including how to sign up for free – right here. "After the Christmas bust, I personally put more money into U.S. stocks than I ever have – by far," Steve says. In a recent essay, he explains why... Plus, he shares what a trusted mentor sees in the outlook for stocks. Get the full story here. "It's a script that plays out over and over again in the markets," Scott writes. "Events that seem like they should spell doom for stocks often don't." The recent government shutdown spooked most investors... but Scott debunked the conventional wisdom. Learn more here: The Shutdown Is Over... And Stocks Could Soar. Boeing is a $234 billion plane maker. This company supplies fighter jets, missiles, and transport aircraft to the U.S. military. These government contracts mean big money… In September alone, Boeing was awarded more than 20 contracts from the Department of Defense. Worth $13.7 billion in total, they cover new refueling jets for the Navy, replacing the Air Force’s aging UH-1N Iroquois helicopter fleet, and more.